Sentinel node biopsy is a reliable and safe technique that avoids most of the complications and morbidity associated with traditional axillary surgery (e.g lymphodema). Surgeons performing this technique undertake specific training and accreditation. By using a combination of a blue dye and a safe radioactive tracer, it is possible to identify the sentinel or “gatekeeper’ lymph node(s) to assess whether the cancer cells have spread to the axilla. Not all patients are suitable for this technique (for example those with large tumours or those that have enlarged glands on their initial assessment). What if the sentinel node is positive for cancer? 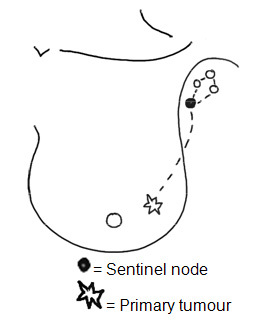 In the event of the sentinel node being “positive” for cancer, the rest of the axillary glands are removed, either during the same operation or at a second operation at a later date. A very small proportion of people are allergic to the dye used. In addition like every test in medicine it has a small failure rate (around 5%). That is why patients are carefully selected for this technique.